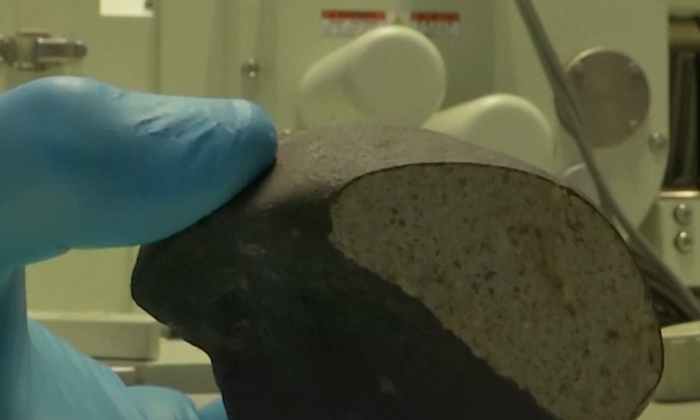 A meteorite, which landed in Holland could help scientists understand the origin of the solar system. People across the Netherlands and Belgium saw its fiery trail on Jan. 11. The stone crashed onto the roof of a shed, breaking its frame but causing no injuries. Scientists are thrilled. Meteorites land every few years, but are rarely recovered. This is only the sixth stone recovered in two centuries. Scientists at the Naturalis Biodiversity Center in Leiden are examining the 1.1-lb. space rock. Senior geologist Leo Kriegsman said the rock is 4.5 billion years old. “If you look inside, it has little globules, little balls of olivine, which come from the earliest stages of the condensation of the stellar cloud when the solar system was starting,” Kriegsman explained. “It tells you the real beginning of the solar system, and that’s spectacular in itself,” he said. Kriegsman said that geologists are limited in their study of Earth and the solar system, because the oldest rocks on Earth are about 4.2 billion years old—too young to reveal the plant’s origins.